Hi, my name is Joseph Little Big Man Blue. Come on in! This is the home of the Devonese Pride. We are a small home cattery run by Ida and Mark Schroeder. Ida is the owner/breeder and we are their cats. We are located in Ironwood, MI. We Rule! We also have a large yard with a garden, squirrels, chipmunks, bunnies, birds and deer for entertainment. Ida's goal is to make all of our kittens wishes come true. All of our kittens are raised with lots of love. Our kittens are raised lovingly underfoot with lots of room and plenty of toys to play with. Our kittens are vet checked and vaccinated before they go to their forever homes. We do our very best to make sure our kittens happy and healthy. So please go to the 'Available Kittens' page to see which kittens are ready to come home with you. 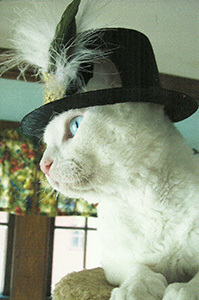 Our specialties include Seal Point, Lynx Point, Torties, Patched and Odd-eyed White Devon Rex. Grand champion lines and CFA registered. For show or pets.